The left image shows Stroeve’s analysis of Arctic sea ice coverage through 2008. (2009 was a bit greater than 2008, but still 20% below average. (The last five years have seen the five lowest average ice extent years on record.) 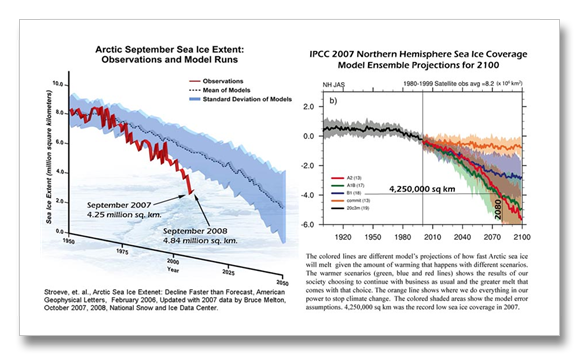 The image on the right is the IPCC 2007 model summary of Arctic sea ice coverage for the different emissions scenarios through the year 2100. The A2 and the B1B (red and green lines) are the IPCC model scenarios with lower mitigation and higher greenhouse gas emissions. What this image shows is that sea ice extent today, or in 2007 was at 4.25 million square kilometers. The green and red lines depicting the IPCC climate models low mitigation/high emission scenarios predict sea ice to be at 4.25 million square kilometers in 2080 – 70 years from now. Stroeve, et. al., Arctic Sea Ice Decline Faster than Expected Geophysical Research Letters, vol. 34, 2007. IPCC Fourth Assessment Report, Technical Basis, Chapter 10 Global Climate Projections, November 2007, page 771. November 18, 2008 OBAMA! More Good News! "My presidency will mark a new chapter in America’s leadership on climate change"
"Once I take office, you can be sure that the United States will once again engage vigorously in these negotiations [Kyoto], and help lead the world toward a new era of global cooperation on climate change." The president-elect said delay and denial were no longer acceptable responses to global warming – "The stakes are too high. The consequences, too serious"
"When I am president, any governor who’s willing to promote clean energy will have a partner in the White House. Any company that’s willing to invest in clean energy will have an ally in Washington. And any nation that’s willing to join the cause of combating climate change will have an ally in the United States of America." "Now is the time to confront this challenge once and for all."